Astronomers have found the remains of the youngest supernova, or exploded star, in our Galaxy. The supernova remnant, hidden behind a thick veil of gas and dust, was revealed by the National Science Foundation's Very Large Array (VLA) and NASA's Chandra X-Ray Observatory, which could see through the murk. The object is the first example of a "missing population" of young supernova remnants. Move cursor over image to blink. 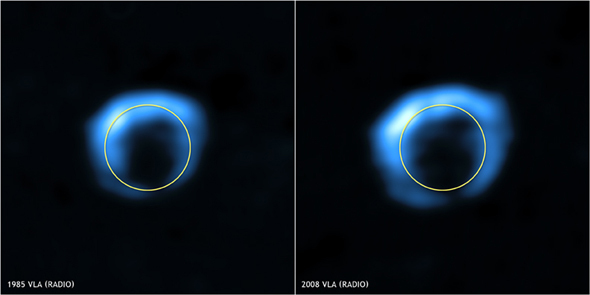 VLA Images of G1.9+0.3 in 1985 and 2008: Circle for size comparison. From observing supernovae in other galaxies, astronomers have estimated that about three such stellar explosions should occur in our Milky Way every century. However, the most recent one known until now occurred around 1680, creating the remnant called Cassiopeia A. The newly-discovered object is the remnant of an explosion only about 140 years ago. "If the supernova rate estimates are correct, there should be the remnants of about 10 supernova explosions in the Milky Way that are younger than Cassiopeia A," said David Green of the University of Cambridge in the UK, who led the VLA study. "It's great to finally track one of them down." Supernova explosions, which mark the violent death of a star, release tremendous amounts of energy and spew heavy elements such as calcium and iron into interstellar space. They thus seed the clouds of gas and dust from which new stars and planets are formed and, through their blast shocks, can even trigger such formation. The lack of evidence for young supernova remnants in the Milky Way had caused astronomers to wonder if our Galaxy, which appears otherwise normal, differed in some unknown way from others. Alternatively, scientists thought that the "missing" Milky Way supernovae perhaps indicated that their understanding of the relationship between supernovae and other galactic processes was in error. The astronomers made their discovery by measuring the expansion of the debris from the star's explosion. They did this by comparing images of the object, called G1.9+0.3, made more than two decades apart. 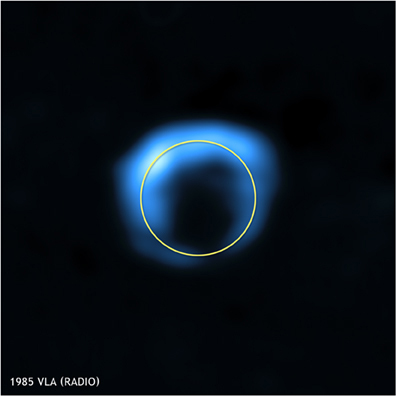 In 1985, astronomers led by Green observed G1.9+0.3 with the VLA and identified it as a supernova remnant. At that time, they estimated its age as between 400 and 1,000 years. It is near the center of our Galaxy, roughly 25,000 light-years from Earth. In 2007, another team of astronomers, led by Stephen Reynolds of North Carolina State University, observed the object with the Chandra X-Ray Observatory. To their surprise, their image showed the object to be about 16 percent larger than in the 1985 VLA image. "This is a huge difference. It means the explosion debris is expanding very quickly, which in turn means the object is much younger than we originally thought," Reynolds explained. However, this expansion measurement came from comparing a radio image to an X-ray image. To make an "apples to apples" comparison, the scientists sought and were quickly granted observing time on the VLA. "I've never seen a large astronomical institution move so fast," said Reynolds. Their new VLA observations confirmed the supernova remnant's rapid expansion. The discovery provides scientists with a valuable source of new information about exploding stars. "Our previous situation was as if someone studying humans could look at babies and at adults, but could not study teenagers. Now, we're filling in that gap," said Reynolds. The object already has provided surprises. The velocities of its explosion debris and extreme energies of its particles are unprecedented. "No other object in the Galaxy has properties like this," said Reynolds. "Finding G1.9+0.3 is extremely important for learning more about how some stars explode and what happens in the aftermath," he added. The discovery was possible because radio and X-ray telescopes, unlike visible-light telescopes, can penetrate the thick clouds of gas and dust in our Galaxy. "Looking out of the Milky Way, we can see some supernova explosions with optical telescopes across half of the Universe, but when they're in this murk, we can miss them in our own cosmic back yard," Reynolds said. "Fortunately, the expanding gas cloud from the explosion shines brightly in radio waves and X-rays for thousands of years. X-ray and radio telescopes can see through all that obscuration and show us what we've been missing," he added. Because of the obscuration, no one could have seen the original explosion 140 years ago. The astronomers are reporting their results in papers published in the Astrophysical Journal Letters and Monthly Notices of the Royal Astronomical Society. Supernova explosions are the violent death throes of stars. These explosions release in one event as much energy as is being released by all the rest of the stars in a galaxy -- typically 100 billion or so. Supernovae seen in other galaxies can outshine the rest of their galaxy for days. The supernovae that have occurred in our own Galaxy and were not obscured by the gas and dust that obscured G1.9+0.3 have often provided a spectacular sight. Historical records indicate that ancient astronomers noted supernova explosions at least as early as A.D. 393, and probably earlier. The pre-telescopic astronomers Tycho Brahe and Johannes Kepler made extensive observations of supernovae in 1572 and 1604. Chinese astronomers noted that a supernova in 1054 was bright enough to be seen in the daytime. A supernova in 1006 remained visible for two years. Supernovae that result from the deaths of stars much more massive than the Sun enrich the galaxy with chemical elements that are produced in the cores of those stars before they explode. The heavy elements, such as carbon, oxygen, iron, siicon and calcium, that make up planets and their inhabitants were made available by supernova explosions. In addition to enriching the material between stars with heavy elements, supernovae stir up that material through the shock energy of the explosion. This is thought to help trigger the process of star formation in interstellar clouds of gas and dust. Many astronomers believe that our own Solar System is the result of such a supernova shock.